I love backpacking and paddling! Growing up I have always admired a grand existence of walking in the woods with nothing but a backpack with which to survive. My interest in gear has followed, quite naturally, as I am now interested in what is the lightest way to walk into the woods. 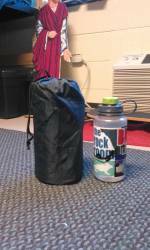 Currently, I use a flat tarp for a shelter and Gossamer Gear frameless pack. I cannot say that I have ever been a heavy packer, but I have learned a lot and gained a lot of experience and knowledge that has helped me reduce my pack weight significantly. Immediately upon receiving the pad, I couldn't help but notice how light and compact it was. It came with a 5.25 in (132 cm) by 13.5 in (342 cm) ripstop nylon stuff sack. To test the sack's water resistance, I put my hand in it and ran in under a sink for 10 seconds. My hand remained dry! Noticeably, the bag was starting to absorb water. I tried again, but this time I focused the water on the seams of the sack. As I expected, water made it through. At the top left side of the pad is the standard plastic screw-type inflation/deflation valve. Twisting it left (counter-clockwise) will open the valve allowing for inflation. Twisting it right (clockwise) will close the valve and stop air from escaping/entering. 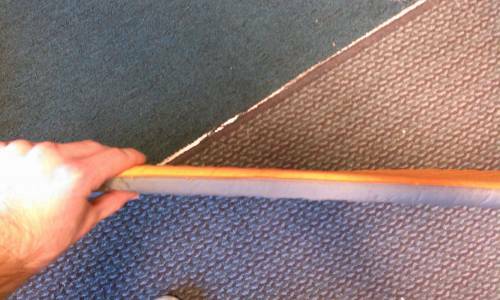 The pad has a tapered design and is wider at the head end and narrower at the foot end. The pad itself is what Therm-a-Rest calls "Daybreak Orange" on top and grey on the bottom. Where the top of the pad meets the bottom, the pad has been glued together, leaving a 0.25 in (0.6 cm) edge going all the way around the pad. The top fabric, according to Therm-a-Rest, is "50 denier Poly" and the bottom is "70 denier Nylon." The top is coated with a cotton-ish fabric that is, in my experience, quite comfortable. If I hold it up to light, I can see the "star punched" foam design inside the pad. The ProLite is filled with open-cell foam called urethane. The "star-punched" foam design, according to Therm-a-Rest, is designed to reduce weight and bulk while still providing 3-season insulation. I have been using the Therm-a-Rest Prolite (from hence will be referred to as the sleeping pad) for several months now. Each time I have used this pad, it has either been without a shelter or used in conjunction with a pitched flat tarp. I originally bought this pad because I wanted a small, ultra-light sleeping pad that would give me some minimal padding between the ground and myself while provide three-season insulation. This pad has met my expectations. I used this pad when my band went on tour; I have used it on several overnighters and as a pack frame for a frameless ruck-style backpack. This sleeping pad packs small, is waterproof, and provides enough comfort/warmth for any three-season situation I've faced. It takes approximately one minute for my pad to self-inflate after fully opening the valve and laying it flat. Typically, I give it one or two puffs before closing the valve. 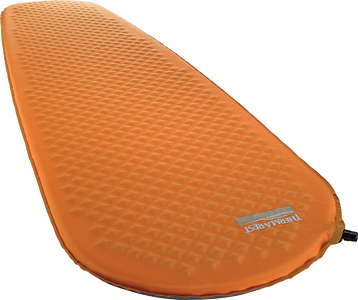 I have primarily used this sleeping pad for overnighters along the Cumberland Trail in the Chattanooga region of Tennessee. The typical temperature range I have experienced while using this pad has been from low 40 F (4 C) to high 60 F (15 C). During one overnighter, I woke up with a small river of water flowing beneath me, but the sleeping pad protected me from getting wet while my friends had to deal with wet sleeping bags. With a few wipes with a t-shirt, the sleeping pad was dry and I went right back to sleep. Typically, I have been intentionally about using this pad on grassy surfaces or straw covered areas. There have been times that I have used this pad directly on rocky, dirt surfaces. I have slept on this pad in dorm rooms and at people's houses approximately 40 nights, as well as outdoors 20 nights. There has been no noticeable sign of physical damage or loss of comfort. In my experience, there are only a few drawbacks. If not placed on level ground, I will find myself sliding off the pad. In addition, when side sleeping I have found that my bottom and my hips touch the ground through the pad. I shift around a lot in my sleep, constantly repositioning and I have not gotten any hip bruises or had any noticeable discomfort. 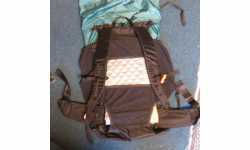 In addition, it does not come with a repair kit, which I think is advisable for distance hikes. Overall, I am very satisfied and have had great success with this pad. Since I am working on going even lighter, I am considering trading this pad for an air-only sleeping pad. For side sleeping, I have found that folding the bottom one-quarter of the pad underneath itself will provide me with enough padding that my hips do not feel the ground beneath the pad. If I were to recommend any open cell foam, self-inflatable pad I would highly recommend this one for its low-weight design, durability, and insulation.